Kids lead a naturally unorganized life, so it’s up to us parents to teach them the basics when it comes to organization. Because of the clutter that builds up in the rest of the house, a kid’s closet is probably the last place they and you are concerned about. After all, house guests are unlikely to see it first hand, but starting with your children’s closets will actually help you in tidying up the rest of the house, and even have the kids cleaning after themselves. As intimidating as all the little clothes can be, sorting through all of them and dividing them into easy-to-reach compartments will save you a ton of work in the long run. Everyone has been a victim of accumulating unused clothing in the closet, and families are no different. By sorting out everything into these categories, you and your kids will find it much easier to find items and organize clothes in the future. The Now pile is reserved for the right-sized, stain free clothing that are currently in season, while items in Too Big will be stored for future use. Store is specifically for hand-me-downs while Give Away should be filled with garments you will no longer use and can donate to friends or charities. Save yourself the trouble of folding clothes and having to refold them when your little ones rummage through them with a second lower rod in the closet, which can be removed later on when they grow bigger and taller. Children will be less confused when trying to figure out which accessories and such belong to which drawer or compartment when you stick a label on them. You can tag boxes, drawers, as well as hangers by the item type, or you can even divide the shelves according to the day of the week. Don’t be surprised if your kids occasionally toss their toys in the closet when cleaning up their room. Always leave a cubby or two in the closet to make room for their stuffed animals and whatnot, so that they don’t get mixed in with the sock or underwear drawers. We all know that it can be difficult getting out of bed and then trying to decide what to wear for the day. 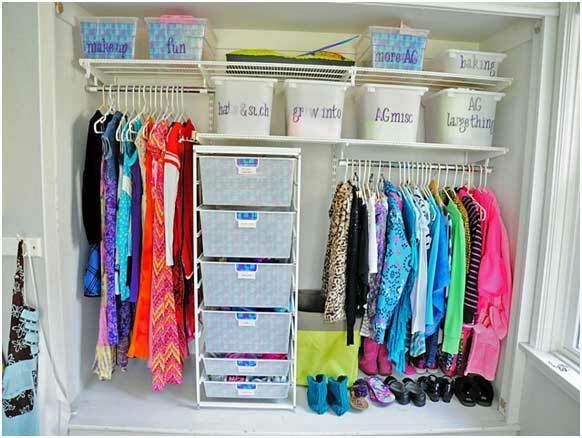 The same can be said for kids, and to make it less of a hassle, decorate the closet to help them look forward to getting ready. Although having fun clothes that are bright, cheerful, and as colorful as a paint box will also encourage self-dressing, having a well-decorated wardrobe is also an important factor in wanting to put on clothes.